As a new diver, I’ve always wondered what tech divers do underwater during those long decompressions. It blew my mind when I would hear about 30-minute bottom times and six-plus hours of decompression. 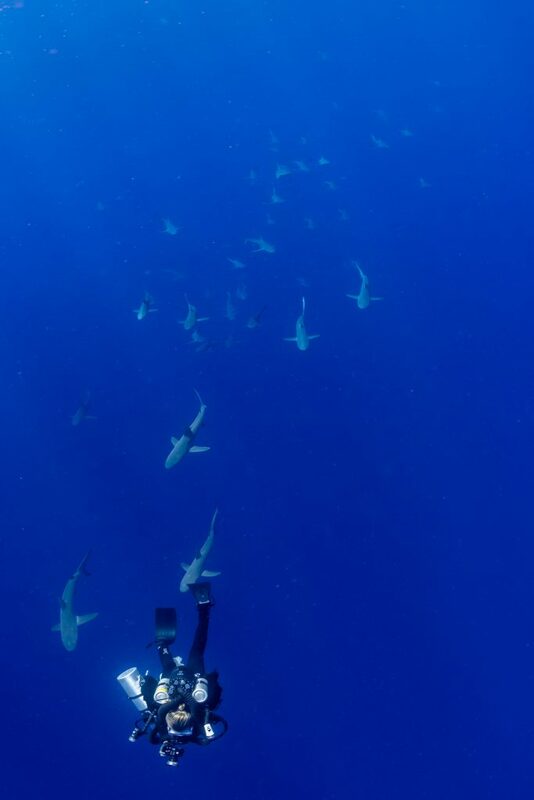 Some of the time there is nothing around, and the divers are just hanging there in blue water for hours! Not all of us spend hours decompressing on dives. But, if you’re curious and mystified like me, or are looking for a new way to pass the time during those long hangs, here are some ideas from deco divers that I polled. Times flies when you’re having fun, right? And one classic way to pass the time is games. 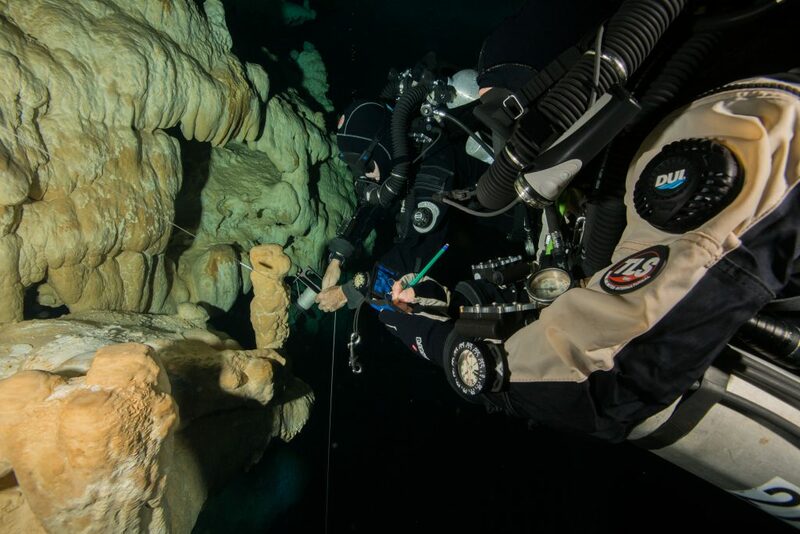 Some divers are playing games like, rock-paper-scissors, tic-tac-toe, and hangman. With wetnotes, divers can even play things like Sudoku while 30 meters below the surface. 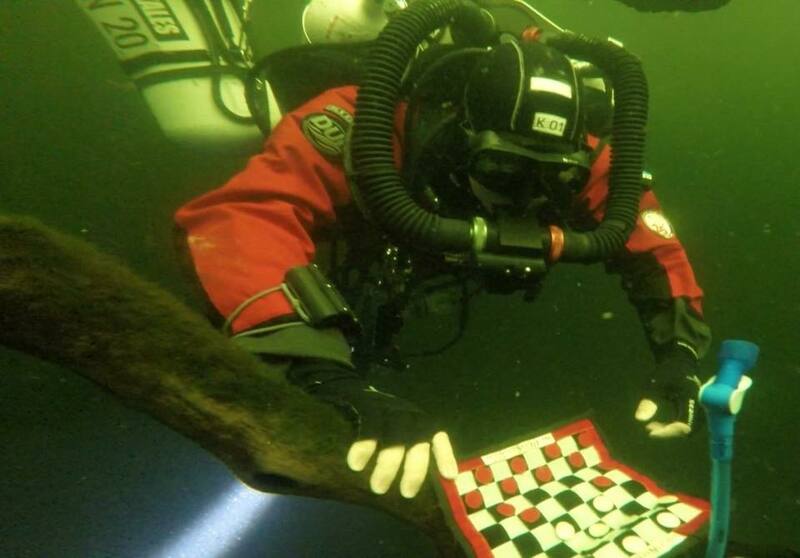 Some divers even take things a step further with mini travel checkers and chess boards. Or they pass the time by taking photos of themselves and their dive buddies. Some people are lucky and their decos can take place along reef walls or other environments teeming with life to see and explore. They may even get a visitor while hanging in the blue water. Photo by TE Roberts, Tethys Images. 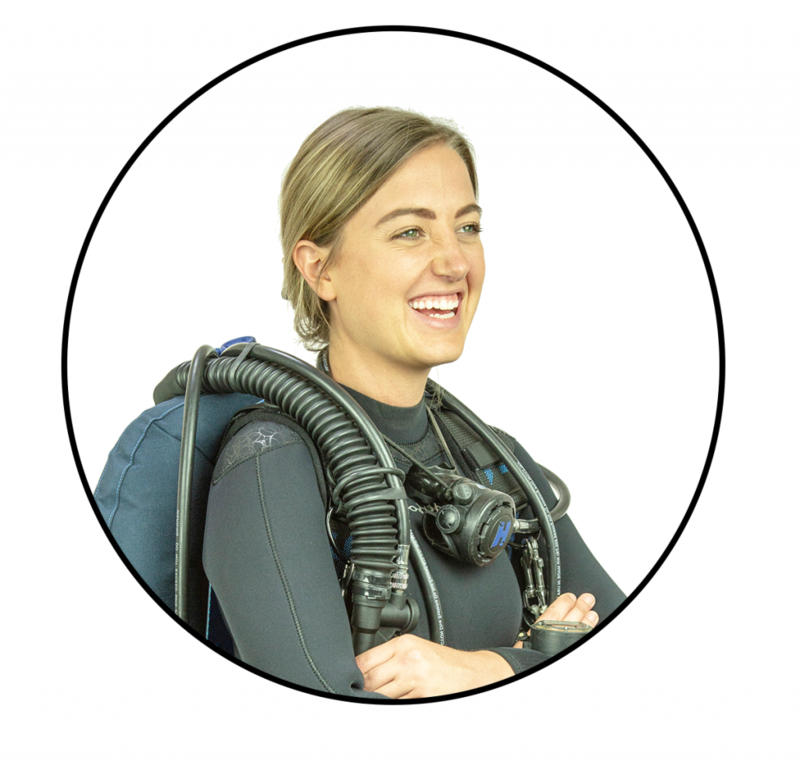 You can also make your time count by helping researchers gather data or completing more of your dive objectives during your deco along a reef or in a cave. Photo submitted by Beto Nava. Submitted by John Kieren and taken by Marc Adolf. There are also companies out there that make devices you can take with you to listen to your favorite tunes while underwater… how well they work is another story. It may not be the same as belting it out in the shower, but it can definitely pass the time. Something as basic as just pondering your thoughts or taking the time to meditate can also be a good use of your decompression. Who knows, maybe you will solve one of the world’s pressing problems during deco. I wonder if there is a record for the greatest depth someone has watched a movie at? One or two movies and your deco is over. 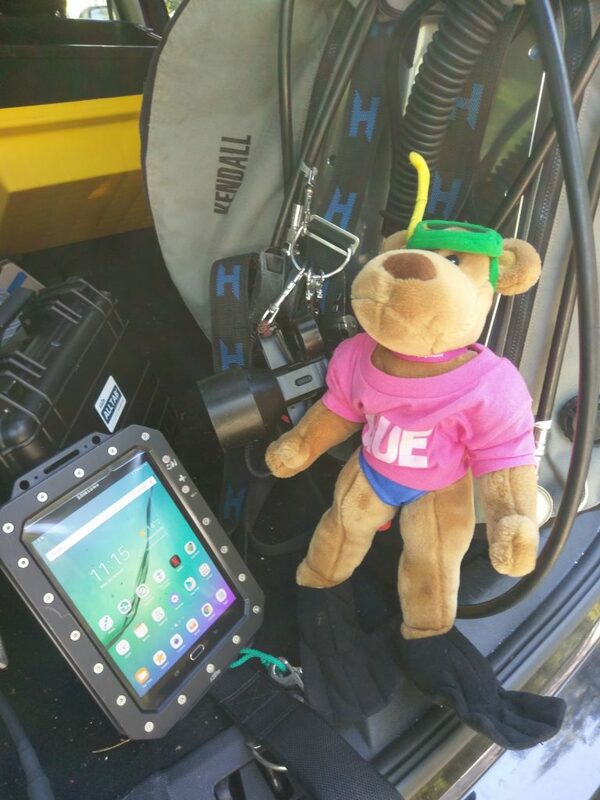 Gershwin the Bear Explorer with Kendall’s tablet before a dive. Photo submitted by John Kendall. 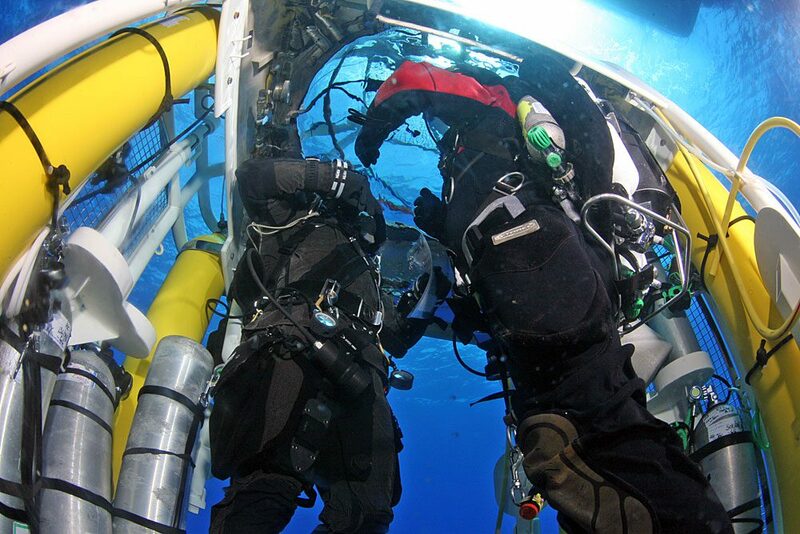 Some technical divers are lucky and they get to spend their long decompressions inside of a decompression bell like those used by commercial divers. Richie Kohler is one of the explorers on several of the recent expeditions to the Britannic that was lucky enough to have a commercial diving bell available to make his long deco tolerable. Photo submitted by Richard Kohler. Photo by Michael C. Barnette. 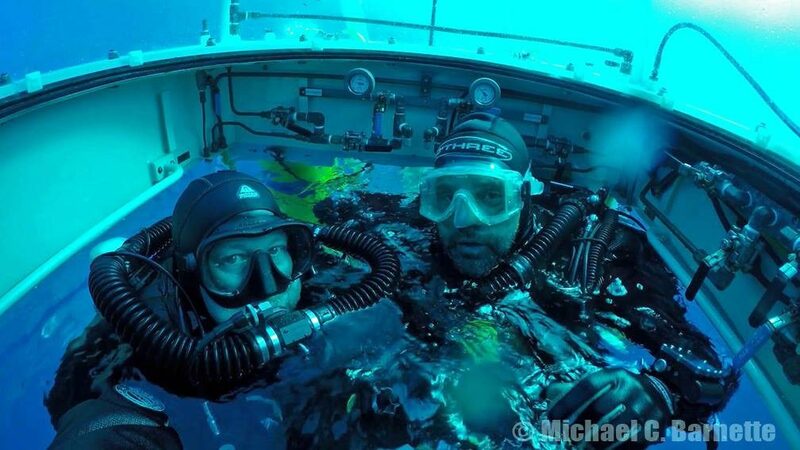 “Our approach to combat boredom on our five to eight hour in-water decompression obligations has certainly changed over the past 11 years since my first Britannic expedition. 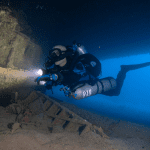 In 2015 and 2016, Britannic operations had the opportunity to use the Russian Geographical Society Vessel, U-Boat Navigator, which had a diving bell for our operations. The clear acrylic dome provided a space where two fully geared divers could stand and be out of the water from the chest up. The bell had a camera and microphone for real-time conversation and observation of the dive team. The bell also had a hot water system that we used to warm our hands and heads during the long hangs. We could play music through the bell and there were various snacks inside the dry area (Swedish fish was a big hit) that we had not been able to enjoy before. Photo submitted by Richard Kohler. 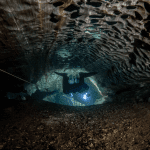 Others, particularly cave divers, are convinced that decompression habitats are the ticket. Some of these even have WiFi, which brings a whole new level to updating your Facebook status. Twin Dees habichat December 8th 2018 from Andrew Pitkin on Vimeo. 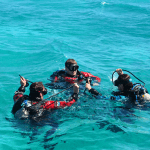 All of these divers are part of a team that is also keeping track of their teammates, the time, the depth, the environment, their gas, and any other factors that could influence their safety while at the same time trying to entertain themselves. If you do something fun or intriguing during your deco stops that isn’t listed here, let us know at indepth@gue.com. Header Image by Julian Mühlenhaus. Amanda White is the editor for InDepth. Her main passion in life is protecting the environment. Whether that means working to minimize her own footprint or working on a broader scale to protect wildlife, the oceans, and other bodies of water. She received her GUE Recreational Level 1 certificate in November 2016 and is ecstatic to begin her scuba diving journey. Amanda was a volunteer for Project Baseline for over a year as the communications lead during Baseline Explorer missions. Now she manages communication between Project Baseline and the public and works as the content and marketing manager for GUE. Amanda holds a Bachelor’s degree in Journalism, with an emphasis in Strategic Communications from the University of Nevada, Reno.